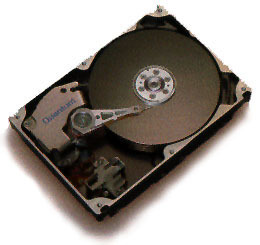 Currently there are two main types of hard disks used in computer systems. IDE is perhaps the most common and is adequate for most tasks including low-end dual stream non-linear editing. New IDE disks are fast, reliable and relatively cheap when compared to SCSI disks. The main difference between the two types is the way in which the drives communicate with the host computer. Put simply, IDE drives are relatively "brainless". This means that the host computer has to constantly check to see what the drive is doing and feed it new instructions. SCSI disks have a much greater degree of self reliance due to having a powerful built-in controller. This means that the host computer can rely on the drive to do what it's told and while it gets on with other tasks. When you need very high sustainable data rates in a multitasking environment, SCSI drives will deliver the data consistently faster than IDE disks. This is why SCSI hard disks are preferred for Non-Linear Editing with high data rates. Individual SCSI drives can give very high sustainable data rates, and a modern single drive will quite happily deliver single stream uncompressed 4:2:2 video at a rate of just over 20m/s. Data rates of 15m/s, or around 1.3:1 compression ratio are usually considered to be acceptable for broadcast quality video editing. When you have two or more streams of video plus graphics, audio, etc, the demand for data from the hard disks is very high. The computer may request more data than an individual SCSI hard disk can reliably deliver. To spread the load multiple SCSI drives can be treated as one device, and this is sometimes referred to as a "striped set" or "RAID array". SCSI has been around for a long time and has evolved from SCSI-I with a theoretical maximum data rate of 5m/s to the current level of SCSI-III with up to160m/s There also have been a number of different physical connectors and cables, some of which work with each other, but only when used in certain combinations. There are a few other devices which use SCSI interfaces including Scanners and CDRom Drives, so the following information is intended to help you better understand the various SCSI hard disk types and the connector plugs that are associated with them. Up to 126 Drives & 12 mile Cables! What we're about . . . ZEN is not a traditional Audio-Visual dealer who started selling computers, nor is it a computer shop that also sells video editing systems. You won't get any salesmen giving you the "hard-sell" when you call, just straightforward advice and information - which for some callers is the knowledge that they don't need to buy whatever it is they thought they needed! Above all you'll be dealing with someone with a wide range of experience and knowledge of both PCs and video production. We're not the biggest, nor necessarily the cheapest, but we are one of the longest established computer/video specialists in the UK. Company history . . . ZEN was started in the 1980s by Martin Kay, then working for ITV at Granada's Manchester studios, who built his first 6502-based computer in 1979 from an Ohio Scientific kit, bought in the USA whilst working as a Sound Recordist on a film shoot for World In Action. With the advent of the Amiga, which could be gen-locked to a video source, Martin started writing a variety of video-related software. This included subtitling & tele-prompting, ident clocks, scoring software for sports & gameshows, and specialist software to mimic other computer displays for use in TV film dramas like Cracker, Prime Suspect and A Touch of Frost. Martin left Granada in 1993 to concentrate on his computer-video activities with ZEN, following a natural path into non-linear editing systems, now the main focus of the business, although he still maintains an active interest in video production. Copyright � 2010 ZEN Computer Services.